The Chestnut Hill Pole Barn combines two stalls with a 12'x24' utility shed that can be your workshop, tractor garage, tack room or feed shed. A 10'x 24' roof in front of the stall doors provides a sheltered outdoor area for grooming. Enclosed floor area is 768 sq. ft. The shelter is 240 sq. ft. The loft is 480 sq. ft.
Plans are $59.00 plus $5.00 for shipping, for three complete sets of drawings. 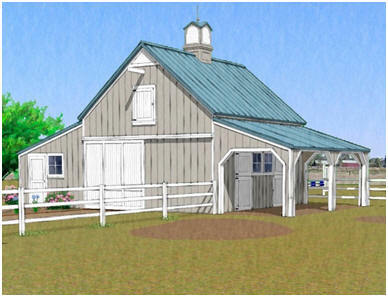 The plans are for inexpensive post-frame (pole-barn) construction, come with a complete money-back guarantee and include a variety of optional add-on horse stalls, sheds, run-ins, garages and grooming shelters that will help you build any of nine standard layouts, including the one shown above. All nine standard layouts are shown on the plans. You can build any of them, or you can use the main barn plans and any of the add-ons to create your own custom design. PayPal's quick, secure checkout accepts all major credit cards.